By Car: Anfield is accessible from all major routes. Follow the M62 to Liverpool until you reach the end of the motorway (beware of a 50mph speed camera about a 1/4 of a mile from the end of the motorway). Then follow the A5058 towards Liverpool. After three miles turn left at the traffic lights into Utting Avenue (there is a McDonalds on the corner of this junction). Proceed for one mile and then turn right at the Arkles pub for the ground. If you arrive early (around 1pm) then there is street parking to be found. Recently a residents only parking scheme has been introduced in some streets around the ground, so check any signs first. Otherwise it as an idea to park in the streets around Goodison and walk across Stanley Park to Anfield, or you can park in a secure parking area at Goodison itself which costs £10. Walton Breck road and Anfield road are also closed prior to kick off. By Rail: Lime Street Railway Station is two miles from Anfield. You can take a taxi from Lime Street (fares usually cost between £7- £9) or buses go from nearby Queen Square Bus Station. On matchdays you can use the Merseyrail network to link with the Soccerbus service from Sandhills Station. By Bus: From Liverpool City Centre, take the 26 or 27 from Paradise Street Interchange, 17 from Queen Square Bus Station or the 917 from St Johns Lane, directly to the ground. The 68/168, which operates between Bootle and Aigburth, and the 14 and 19 (from Queen Square) stop a short walk away from the ground.The 'Gillmoss Park and Ride' facility is available on a matchday for fans. 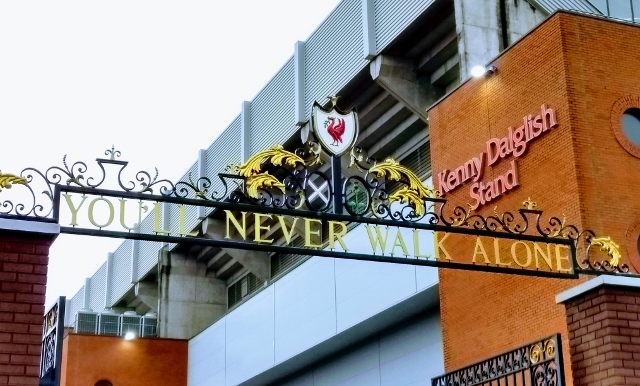 The Soccer Bus runs from Sandhills Station, on the Merseyrail Northern Line, to Anfield for all Liverpool home Barclays Premier League and cup matches. The Soccerbus runs two hours before each match (last bus from Sandhills Station is approximately 15 minutes before kick-off) and for 50 minutes after the final whistle (subject to availability). The Soccerbus will run for the match but other services may be limited. The Arkles pub near to the ground is known as the away fans pub, but as can be expected it can get extremely crowded. The Flat Iron is a five minute walk away and usually mixed home/away fans. Please note large bags are not allowed in the stadium.